Click on the logo to see how you can serve others at Hillcrest and in our community with your time and talents. Hillcrest loves kids! In order to provide a loving and caring environment for our kids ages 0-2 years in our His Kids Nursery, we need your help! 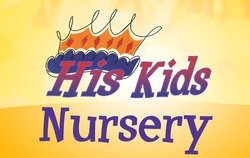 Click on the nursery logo or the link below to sign up on the nursery calendar. Thank you in advance for helping us care for our youngest members on Sundays! Hillcrest Volunteer Opportunities - click on the logo to find a wide variety of ways to serve at Hillcrest!